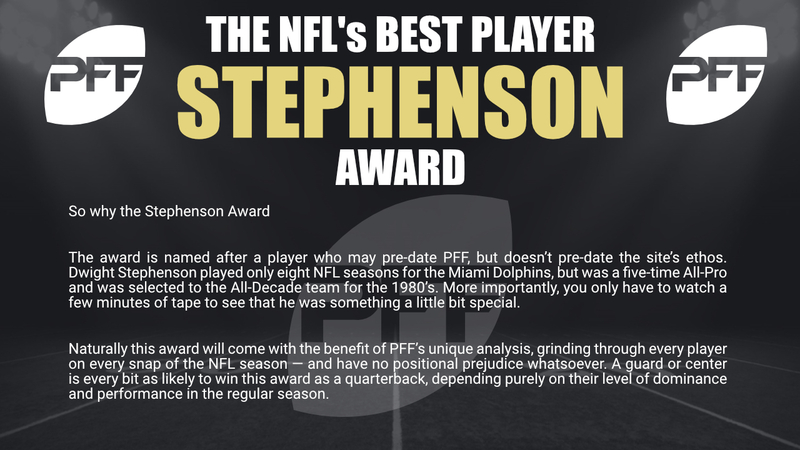 Awards week is in full swing at Pro Football Focus, and one of the big differences between our awards and those you will find elsewhere is the absence of any MVP award at PFF. In many sports, the MVP is also the best player in the game, but in football we seem to tie ourselves in knots over the unquantifiable ‘value’ aspect of MVP. This becomes even more of a problem because football, more than most sports, is defined by one position of paramount importance — quarterback. Quarterbacks are by far the most important position in the game, and if we want MVP to be anything more than an award for the best quarterback, we need to broaden the horizons of the criteria. Instead of getting bogged down in the mess of assigning value to every position and aspect of the game, PFF instead looks simply to reward the best player in any given year, regardless of position. 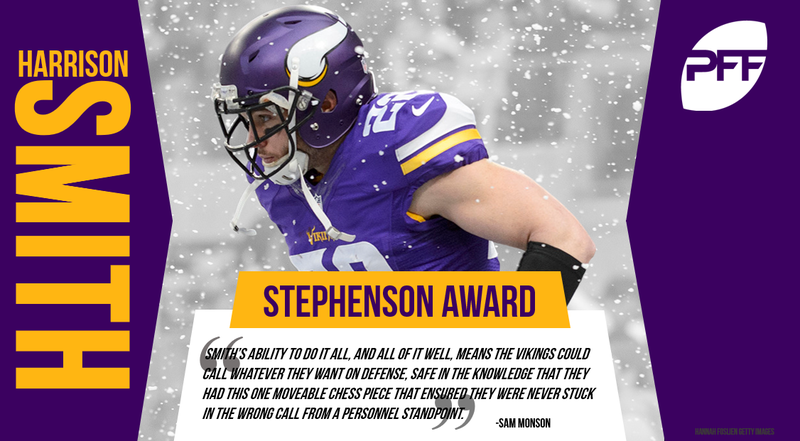 There were a few players that really stood out this campaign, and the battle for this award went down to the final game of the regular season, but in the end, the winner was Minnesota Vikings safety Harrison Smith. Grading is a play-by-play account of what somebody did on the field and captures the kind of context that may not always show up in the box score, such as hits that dislodge the ball from a receiver attempting to catch it to prevent a first down or tackles that give up yardage but force a punt by stopping progress short of the first down markers. Smith ended the regular season with an overall grade of 98.8, which wasn’t just the highest for a safety this year, it was the highest grade of any player regardless of position. That 98.8 was also by far the highest mark we have ever given to a safety over the past 12 years of grading, easily eclipsing the previous best of 94.7 owned by Eric Weddle for his 2012 season. Harrison Smith was the player that made that Minnesota Vikings’ defense tick, and despite being humiliated by the Philadelphia Eagles to end their playoff run in the NFC Championship, this is a defense that ended the regular season as the No. 1 unit in the game and was historically great on third downs. The first aspect of Smith’s game that is worth drawing attention to is his versatility and how much the Vikings took advantage of that with his alignment. 38.5 percent of Smith’s snaps were spent as a deep free safety in Minnesota’s various coverage looks. He spent 44.6 percent of his snaps as a box safety, up around the line of scrimmage in a multitude of different gap assignments, and the rest of his snaps were split between covering the slot and a couple of dozen times where he was split out wide as a boundary cornerback in matchup looks. Smith’s ability to do all of this, and all of it at a high level, means the Vikings could call whatever they want on defense, safe in the knowledge that they had this one movable chess piece that ensured they were never stuck in the wrong call from a personnel standpoint. With all of these responsibilities, Smith was among the top players in virtually every safety number you care to look at. He had five interceptions and five pass breakups, which combined trailed only two other safeties. As a percentage of targeted passes, Smith’s playmaker index was also the third-best among all safeties, and he didn’t surrender a touchdown all season in primary coverage. In fact, Smith allowed just 0.25 yards per snap in coverage this season, the best figure among safeties with at least 25 targets, and second in the league if that qualifier moves to as low as just 15 targets. He achieved those coverage numbers while also having a top-10 run-stop percentage, and only two safeties recorded more total QB pressures than Smith did over the season. Smith was sent on the blitz 28 times on the year and generated some kind of pressure on those snaps 10 times, including a pair of sacks. When you turn on the tape, you see a player at the heart of every meaningful play on the best defense in the NFL, and somebody that was far more influential than any other safety during the 2017 season. 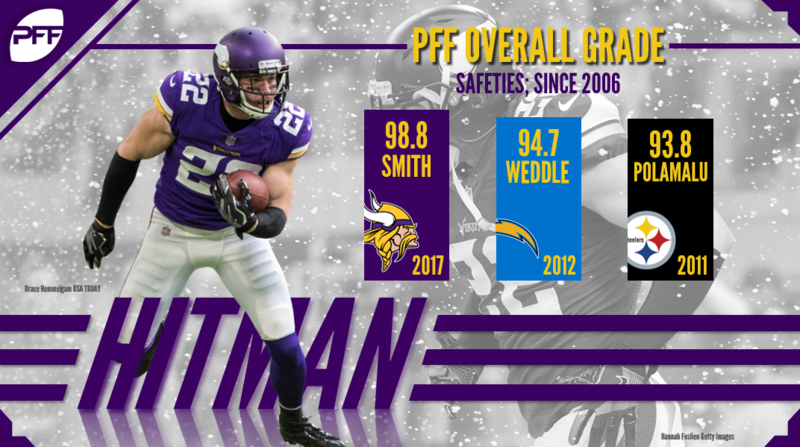 Because he is a safety, Smith stands no chance of garnering any kind of MVP recognition, but if you look purely at the best players in the game this season, there is little doubt that he was one of the best in the game, and in PFF’s opinion, the best in the entire league. 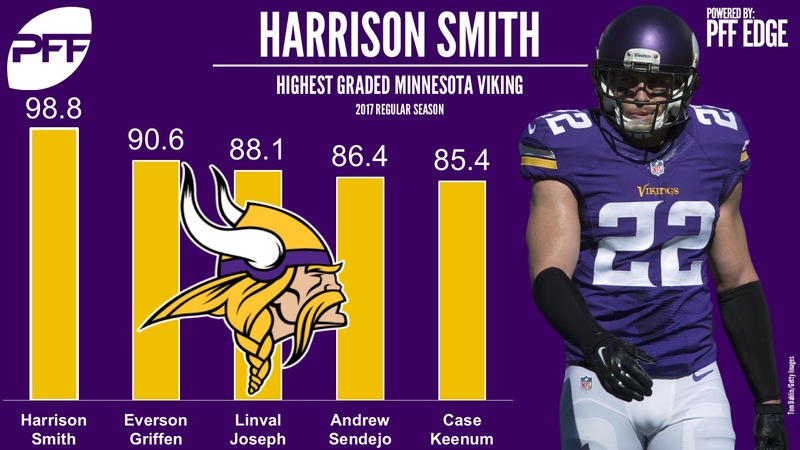 Harrison Smith becomes the latest recipient of PFF’s Dwight Stephenson Award for his remarkable 2017 season.